The Attribyte mobile app is a tech-news browsing and discovery application that allows you to follow headlines on the people, topics and stories that interest you. 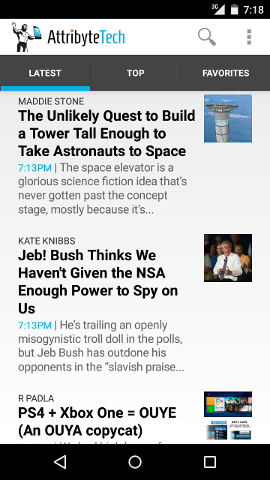 Built on Attribyte's search platform and API, our mobile app provides four different views: The latest headlines, algorithmically discovered top stories, favorite digests based on your saved searches, and detail pages that link to the full article, allow sharing, and suggest related headlines. Attribyte’s core service, shared by all applications, crawls blogs and sites to classify and store posts, pages, and tweets. Those that cover technology are replicated to a pool of servers supporting the mobile app. These servers analyze and index the stream of headlines supplied by the core service, and they provide the API the app calls for performing searches and displaying different views. 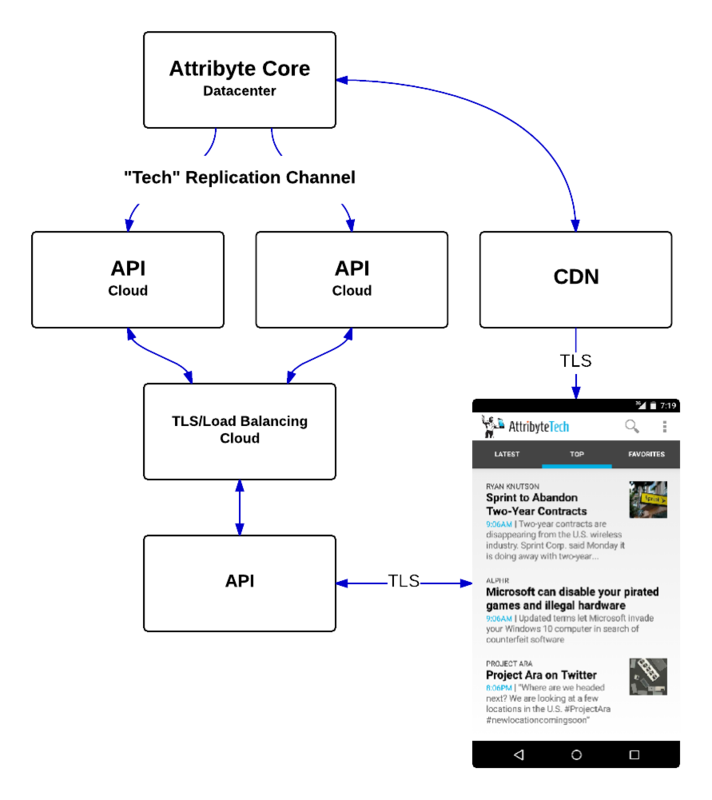 The following diagram shows how the mobile app is deployed on Attribyte's platform. The latest view shows the newest headlines. 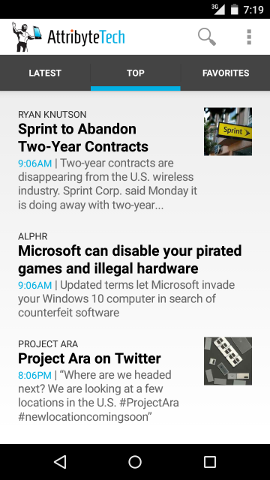 To generate this view, the platform API is called to select the most recently added articles, sorted chronologically. Attribyte extracts and indexes all link relationships to build a graph that is used to find the top stories. These are pages that are most linked to. They are not necessarily blog entries or come from a feed. The posts may be a tweet, a press-release, a product page, or even an academic paper published as a PDF. The view is generated by an API call that selects the top pages discovered in the past 24 hours. You can use the search box to find stories that contain words or phrases. A rich query language allows you to create complex, boolean expressions to describe exactly what you want. 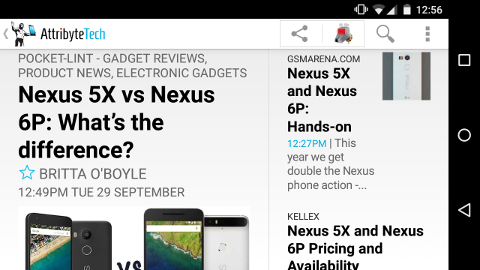 For example, this API call returns articles that have a title containing both "google" and "android" but not "tablet". Typing a complicated expression into a search field, especially on a mobile device, is inconvenient. We came up with an easier way to execute a search. You highlight any word or phrase to search for it immediately, or highlight a second phrase to find stories that contain both (AND), or only those that include the first but exclude the second (NOT). Once you've created a search, you can save it under a unique name for future use. Saved searches are displayed as favorite pages. If you like a particular author, you also can add them as a favorite. 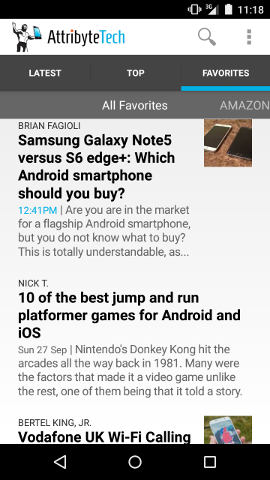 Favorite pages update whenever a match is found, and are aggregated to produce a convenient personalized digest of headlines. The detail page lets you take action when a headline interests you. From here, you can view the full article in a browser, share the article with others, mark the author as a favorite and see other related stories. Our tech-news app is, we hope, the first of many applications built on the Attribyte platform. In future studies we'll demonstrate a standalone website and show how you can use the API to add aggregated search to your existing applications.